So before I disappear into the mire of endless turkey and trimmings, I thought I'd do another review to kick Christmas eve off. I was really excited when I received this in my inbox, as along with the Northless 10" I reviewed a couple of weeks back, this record was one I'd been looking forward to hearing since it was announced. It features two bands that really need no introduction. Northless are a sludge outfit from the bowels of Milwaukee and bring two lengthy tracks to this release. Light Bearer are a progressive metal band from London, England and contribute one track. Ever since I bought Light Bearer's full length, Lapsus, I've been spellbound by them, so getting the chance to review this record is pretty awesome. The LP itself has been released by the ever brilliant Halo of Flies and their cohorts Alerta Antifascista and Moments of Collapse. Northless open with Tears From Crime. Instantly it's a heavy, riff-laden beast with pounding drums and vocals that sound like they come from Lucifer himself. There's melody amongst the noise, with some low-end guitar, which makes it feel like the walls are closing in on you. Northless ploughs through five+ minutes of sludgy, progressive metal that leaves you seeking only solace. For as Long as You Shall Walk the Earth Your Blood Will Reek of Failure is the up next, and like it's title, it's a mammoth of a track. It feels slightly more id-paced than Tears From Crime, but that only adds to it's heaviness. There's more use of subtle off-kilter time signatures and there's some more melodic treble on show too. Things take an even gloomier turn mid-way through the song. Northless slow down and with that change of pace comes a more wretched low-end. There are still some metallic riffs that help the odd ray of light to shine through the haze, but as before it's not there for security! Light Bearer's contribution is Celestium Apocrypha: Book of Watchers. It weighs in at nearly twenty-two minutes and starts with slow building, haunting noise. The noise levels increase near the five-minute mark as the drums kick out a kind of tribal beat. The guitars are low and there are orchestral sounds included in the mix. Light Bearer make the song sound almost otherworldly, with the inclusion of different elements and textures. Anyone who's listened to Lapsus more than a few times will see similarities, but this song sees the band progressing further. The choral singing in the mid section is very haunting, but fits the song perfectly and is a brief moment to catch your breath. The rest of the song floats passed and leaves you in a trance. The instrumentation and the arrangements means the song flows really well and thanks to a good production, as with the Northless tracks, you've got a pretty perfect LP. Both bands provides glimpses of what they are capable of, which should be enough to make you want to go and investigate the rest of their releases. 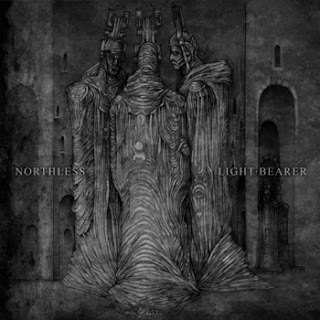 You can also find Northless at http://www.northless.com or http://www.facebook.com/pages/NORTHLESS and Light Bearer at http://lightbearerband.wordpress.com or http://www.facebook.com/pages/Light-Bearer.